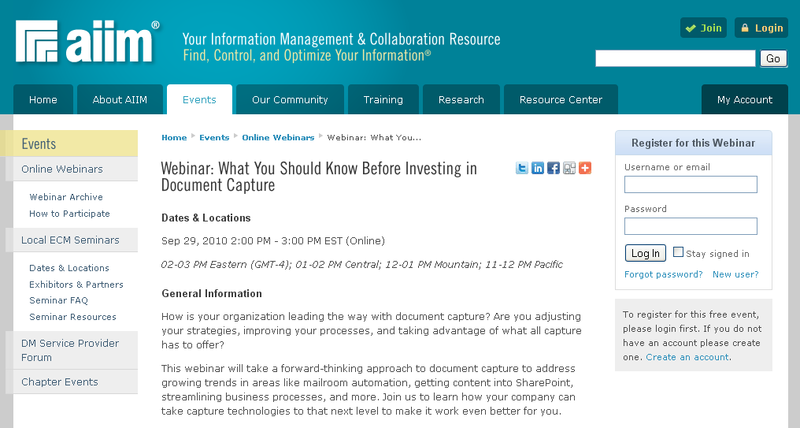 AIIM has a Webcast on September 29th titled “What You Should Know Before Investing in Document Capture”. Harvey Spencer from Harvey Spencer Associates will be presenting on this Webcast. I attended Harvey’s annual capture conference a few weeks ago, and I’m sure Harvey will have a lot of great insight to provide on growing trends in the market, where companies are or should be investing, and where SharePoint fits into the big picture. If you have a chance, I encourage you to attend. A new white paper from Harvey Spencer Associates on Capture for SharePoint 2010 is available – Intelligent Enterprise Capture: A Document On-Ramp to SharePoint 2010. The paper reviews some of the new capabilities of SharePoint 2010 and how intelligent enterprise capture connected with SharePoint can support the automation of paper based processes in both departmental and large-scale distributed enterprise applications. In many ways Microsoft SharePoint 2010 has brought ECM to the masses in a simple and easy-to-deploy way, but let’s not jump to conclusions and think SharePoint has everything you need. SharePoint 2010 provides a foundation for ECM, but it is missing quite a few ECM puzzle pieces – archiving and library services, business process management, transactional content management, scanning and capture, and physical records management. Some or all these may be important to an organization looking to use SharePoint. One could also debate whether or not all the capabilities needed to support document management, records management, human centric workflow, and other key ECM functions are there. We can debate those other areas another time.